Charlie Chaplin, whose own life reflected the classic story of the underprivileged underdog succeeding in a disdainful world, went on to make a string of classic silent-films that presented that narrative in comic form. In these films he always played the role of “The Little Tramp”, who mischievously managed to get around the imposing bullies blocking his path. One of his most famous works along these lines was The Gold Rush (1925), which was an immediate hit at the box office and was ranked on the British Film Institute’s 2012 poll of international film directors as the 91st greatest film of all time . The story of the film is set during the famous Klondike Gold Rush in Yukon, Canada (1896-99), during which some 100,000 eager prospectors were drawn to the region hoping to make their fortune . Conditions in that far north region were cold and bleak, and lone prospectors faced the threat of death due to starvation and exposure to the elements. Mindful of these conditions, Chaplin originally chose to shoot the film entirely on location in Truckee, California, in the Sierra Nevada mountains, which was the site of the famous Donner Party tragedy (1846-47), where early stranded migrants were reduced to cannibalism. Chaplin’s shooting style was leisurely – for creative purposes, he shot his films in sequence and often made things up as he went along . So the production of The Gold Rush took fifteen months to shoot . He originally cast his own 15-year-old mistress and soon-to-be wife, Lita Grey, in the role of the female lead, Gloria. 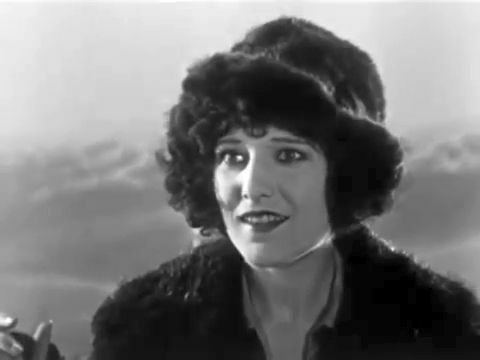 However Lita’s increasingly evident pregnancy proved to be incompatible with the slow pace of production in Truckee, and Chaplin chose to replace her in the film with Georgia Hale and reshoot everything back in the Hollywood studio . So the final, released version of the film had very little of the original location footage. 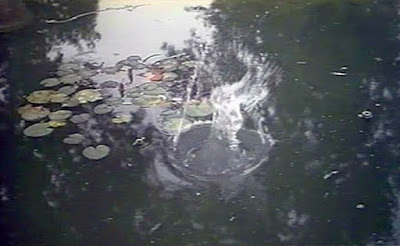 What most people recall when they comment about the film, though, are several slapstick comedy scenes, which have been carefully choreographed for maximum effect. 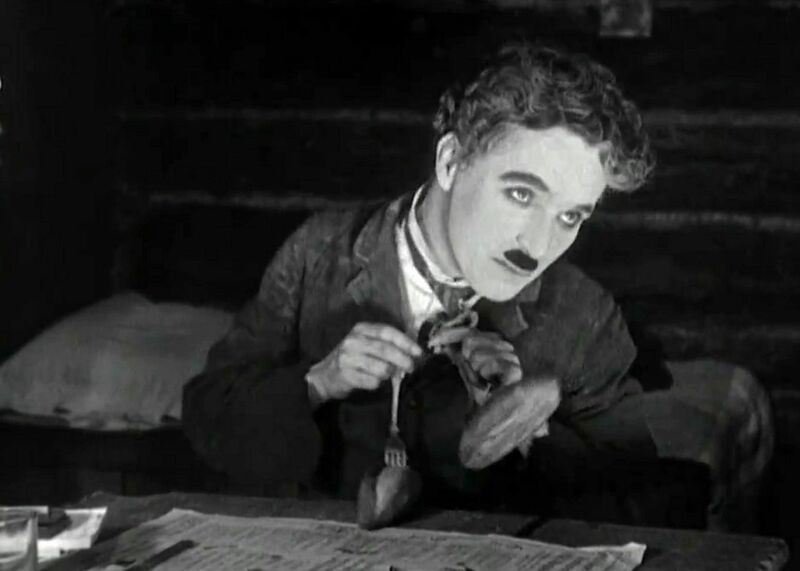 But what makes The Gold Rush, along with Chaplin’s even greater City Lights (1931), truly outstanding works is the balance between humor and pathos that courses throughout the story . In both those films there is a wistful romance that is treated with surprising delicacy and subtlety. This is brought about by making the female lead more than just a simpering beauty; she is a person whose own nontrivial emotions are an important element in the story. So Gloria Hale’s expressive performance turned out to be an important component in the film’s success. This is a man’s world, and The Little Tramp is a lone, penniless waif whose only resource is his cheeky spirit. He is surrounded by oversized bullies who dismiss him as a no-account. The Little Tramp is innocent and a seemingly hopeless underdog, so the viewer’s sympathies are with him. This is a world seeking a woman’s love, and The Little Tramp’s innocent naivety seems even more hopeless in this arena. He doesn’t offer manly virtues but only undying gentlemanly tenderness and affection. In The Gold Rush we switch back and forth between these two separate arenas as the story proceeds through five unequally-lengthed acts. The film opens by introducing the Klondike Gold Rush and showing The Lone Prospector (played by Charlie Chaplin and whom I will refer to as The Tramp) wandering alone in the snowy mountains. Chaplin is shown, of course, with his signature cane, derby hat, and shabby vest. Here we are in the Survival arena and The Tramp faces two oversized brutes who are also lone prospectors – Black Larsen (Tom Murray) and Big Jim McKay (Mack Swain). Black Larsen is a murderous outlaw wanted by the Royal Canadian Mounted Police. Big Jim McKay is a burly prospector who at the film’s outset is shown discovering a fabulously rich lode of gold ore for which he is ready to stake his claim. Just then, though, a furious snowstorm comes up, and The Tramp and Big Jim separately stumble for shelter into a lone cabin occupied by Black Larsen, who wants to get rid of the two intruders. There are several slapstick scenes in this act that people remember (in fact most of this act consists of slapstick struggles). One involves Larsen and Jim struggling over possession of a rifle which, despite the constant movement and chaos, is always pointed at The Tramp, no matter what he does to get out of the way. Things finally settle down between the men, but since the blizzard continues unabated, the men run out of food and begin to starve. In this connection there is a memorable scene showing The Tramp cooking and serving one of his boots to eat. 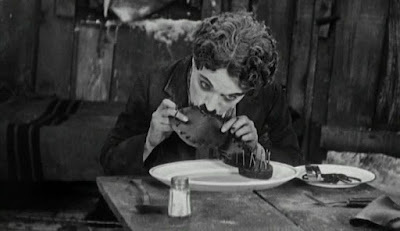 To Jim’s astonishment, the starving Tramp seems to relish the cooked boot sole as if it were a fine epistolary delicacy. Later the starving Jim becomes delusional and has hallucinations of The Tramp turning into a tasty human-sized chicken. He is just about to shoot The Tramp with his rifle and eat him when he finally returns to his senses for a moment. Their continuing struggles are finally interrupted by an intruding grizzly bear, which The Tramp manages to shoot with the rifle, thereby solving their food shortage. By this time, Larsen, who had gone off alone to find food, comes across Jim’s gold-ore lode. Meanwhile Jim and The Tramp, now fortified with food, leave the cabin and part company. Jim heads back to his claim site, while The Tramp heads towards the local mining town. When Jim gets to his claim site, Larsen hits on the head with a shovel and knocks him out cold. However, the murderous Larsen soon falls off a cliff to his death. So now of our three original lone prospectors, two of them are out of commission, and only our Tramp seems to have survived. The Tramp, the modest little guy (5'5"). Gloria is attracted to Jack, but chafes at his rude possessiveness of her. To spite Jack, she chooses the nearby and unassuming Tramp to dance with her. The Tramp is immediately smitten and doesn’t realize that he is just a pawn in Gloria’s game with Jack. Later the still-impoverished Tramp is asked to look after a miner’s near-to-town cabin while he is away. Gloria and a group of her dance-hall girlfriends having a friendly snowball fight pass by and are invited inside by The Tramp. 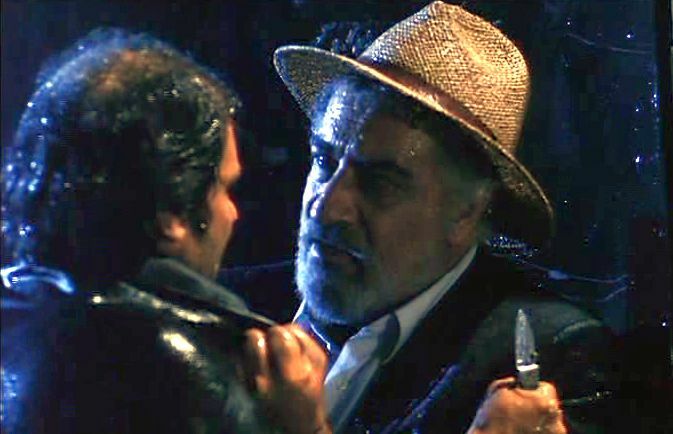 Remembering the occasion when she danced with the gentlemanly Tramp, Gloria shows warm cordiality towards him. When he shyly invites them all for dinner on New Year’s Eve, Gloria accepts his invitation for all of them, and The Tramp is thrilled. After the girls depart, he leaps about for joy, almost trashing the cabin, in an acrobatic slapstick scene. 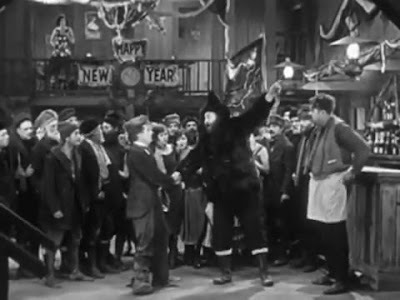 On New Years Eve, The Tramp has made elaborate preparations for dinner, but the girls don’t show up, and he falls asleep and dreams. In the dream the dinner party goes ahead, and Gloria shows some affection for The Tramp. The dream scene is highlighted by The Tramp’s puppet-show dance performance of “Oceana Roll” with a pair of forks poked into baked buns. Meanwhile the New Year’s festivities are proceeding at the dance hall, and the partying dance hall girls have forgotten all about The Tramp and his dinner invitation. After midnight, though, Gloria remembers, and she invites her girlfriends to go over to the foolish Tramp’s cabin for a little more “fun”. On the way there, Jack asks Gloria if she loves him, and she says yes. When they arrive at the empty cabin (The Tramp has gone to town looking for the girls) and Gloria sees The Tramp’s elaborate preparations for a dinner party, she feels remorseful and is not in the mood for Jack’s horseplay. When Jack arrogantly tries to forcefully kiss her, she slaps him in the face. Big Jim McKay is shown finally having come to and found his way back to town. But he is still suffering from memory loss and cannot remember where his claim site is. At the dance hall Gloria, upstairs, writes a love note to be passed to Jack, sitting downstairs, apologizing for what she did last night and swearing her love for him. But when Jack reads the note, he laughs it off and shows it to the other girls (he always has his retinue of girls around him). Then, as a mocking joke, he has the waiter pass the intimate note to The Tramp, who is standing nearby. Gloria looks down on this disdainful behavior in horror. The Tramp, thinking the note was intended for him, is thrilled to read it and rushes about looking for Gloria. 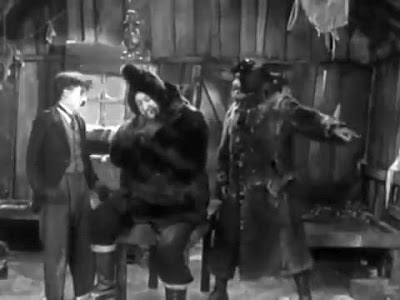 But just then, Big Jim shows up in the dance hall and upon seeing The Tramp realizes that the little man can lead him back to his claim site, which was near Black Larsen’s cabin. So, promising to share his future wealth with the little man, he grabs The Tramp and starts to forcefully drag him away. Just before they depart, The Tramp sees Gloria and promises to her that he will make his fortune and return to her. Jim and The Tramp make it to the cabin and there are more shenanigans, as the Survival scenario resumes. Another big blizzard hits, and the cabin is blown down a hillside and finally stops teetering on the edge of cliff. 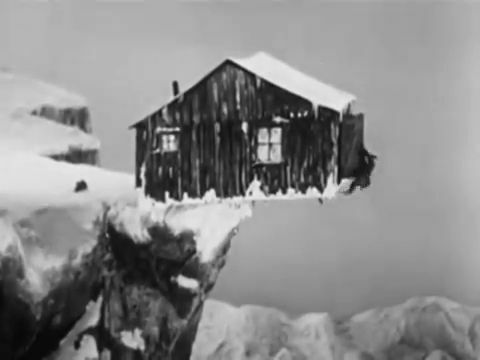 There is more slapstick as Jim and The Tramp struggle to keep the teetering and rocking cabin from plunging off the cliff. But after some breathtaking moments, they finally get to safety, and Jim finds his claim. The scene now shifts to a ship on the way back to the States. Big Jim and The Tramp are now both millionaires decked out in fancy clothes and attended to by servants. But it turns out that Gloria is alone and on that ship, too, down in the lower third-class deck. And happenstance leads them to meet and establish their happy union at last. There is no coverage in the film as to why The Tramp had not met up with Gloria after he and Big Jim had returned from the cliff to stake their claim and become fabulously wealthy. We just have to assume that circumstances had kept The Tramp and Gloria apart until their later meeting on the ship to the States. Some people might feel this absence of account to be a narrative flaw in the telling. But in the context of the Love scenario, this temporal jump forward works well, and Chaplin made the right choice to tell the story this way. As already mentioned, the numerous slapstick comedy bits, mostly inside the cabin, are what people cite when praising “The Gold Rush”, but it is the intermingling of the Love with the slapstick Survival scenario that makes all these scenes poignant. The Love scenario is especially interesting because of its presentation of Gloria. There is no denying that Gloria is, for a time, in love with two men at the same time. And this is something that occurs more often than most people care to admit. But it does sometimes happen in the ever-shifting course of human relationships. People can love two people at the same time. Gloria loves the alpha male Jack, whose manly virtues and swagger are evidently attractive to her. We know this, because she has explicitly confirmed to him that she loves him, and she doesn’t look like the kind of person who would make such avowals lightly. But early on she bemoans the fact that she has been unable to find a man who truly stirs her heart. There seems to be no real depth to her relationship with Jack. When she encounters The Tramp, his sincerity and innocence offer a different and more authentic kind of relationship to her, and she apparently finally comes to realize this. She doesn’t articulate these gradually changing feelings in words, but she expresses them in her gestures and emotive facial expressions. This is what help makes the film an expressive work of art. And it offers a lesson as to what can be accomplished even in the purely visual domain of silent film. Even today Yukon’s population is only a fraction of that figure. 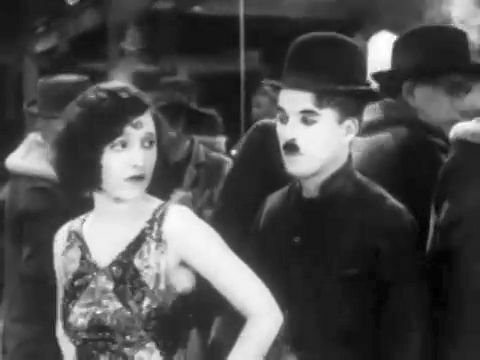 Alan Vanneman, “Looking at Charlie — The Gold Rush: An Occasional Series on the Art and Life of Charlie Chaplin”, Bright Lights Film Journal, (1 November 2007). Tim Dirks. 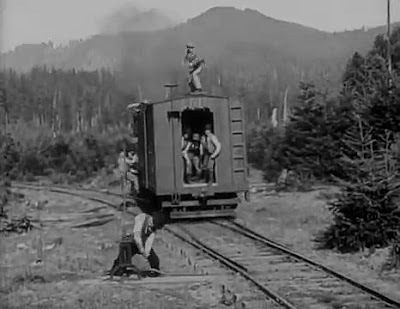 "The Gold Rush (1925)", Filmsite, (retrieved 24 April 2018). 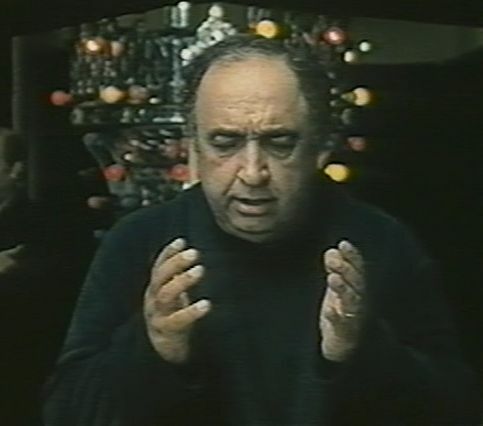 Dan Harper, “The Gold Rush”, Senses of Cinema, (October 2002). Of the string of brilliant silent-film comedies Buster Keaton made in 1920s – which include Our Hospitality (1923), Sherlock Jr. (1924), The Navigator (1924), Seven Chances (1925), The General (1926), Steamboat Bill, Jr. (1928), and The Cameraman (1928) – the one that is most remembered and most honored today is The General (1926). This is particularly interesting, since the The General lost money and was initially a flop with the critics at the time of its release. But that work was the most carefully preserved of Keaton’s films and the one that has been most seen by subsequent audiences. And since those early days, the film’s reputation has swelled dramatically. Many film critics consider The General to be Keaton’s greatest film and one of the greatest films ever [1,2,3]. In fact in the British Film Institute’s decennial polls of greatest films ever made (published in its outlet Sight & Sound), international critics ranked it #8 in 1972, #10 in 1982, and #34 in 2012 [4,5]. And in the British Film Institute’s 2012 poll of international film directors, The General was ranked 75th greatest film of all time . There are a couple of things that stand out in connection with The General. For one thing, the film is based on true events that took place during the American Civil War (1861-1865). It tells the story of the Union army military theft of a railroad train in Confederate (Southern) territory in 1862 and the ensuing chase for its recapture, known as the Great Locomotive Chase . 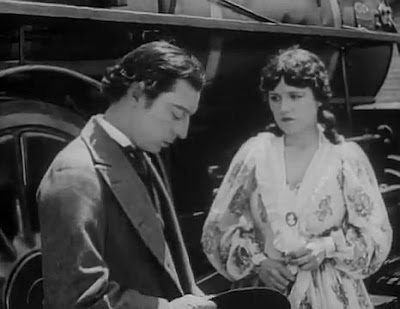 Although the original memoirs of these events were told from a “Northern” perspective, Keaton felt audiences would be more sympathetic if the narrative focus to were shifted to the perspective of Southern protagonists. Another distinguishing feature of The General is its unrelenting presentation of a manic series of physical events that draw the wonder of any viewer as to how the filmmakers were able to engineer (and survive) them. These all contribute to the usual Keaton theme of an innocent and intrepid young man facing a hostile and seemingly overwhelming universe blocking his sincere intentions. Actually, this was always a feature of Keaton’s films at that time, but The General went to further extremes in this regard than any of his other films and could be considered to be a marvel of cinematic engineering . The story of The General is told in five acts of unequal length. 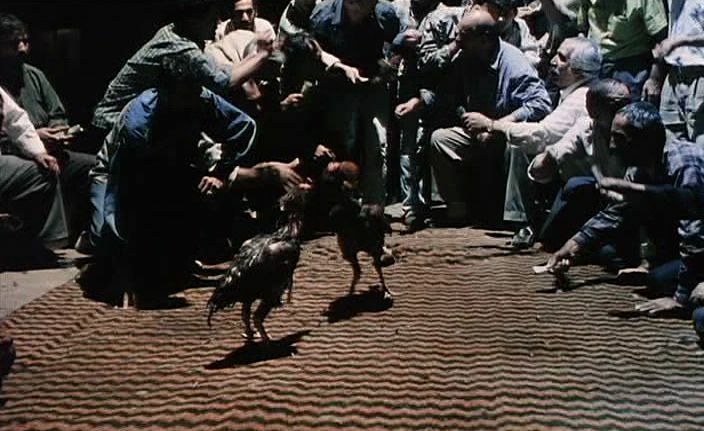 But the core of the film and the source of its appeal is presented in the two acts featuring chase scenarios – “Chase #1" and “Chase #2". 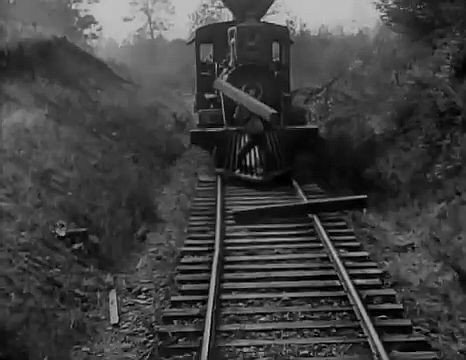 The film starts in 1861 in the Southern city of Marietta, Georgia, where young railroad engineer Johnny Gray (played by Buster Keaton) has two passions – his girlfriend Annabelle Lee (Marion Mack) and the locomotive for the Western and Atlantic Railroad for which he is the engineer (driver), The General. When news of the Civil War’s break out, everyone rushes to enlist in the South’s army. But Johnny is turned away, because, unbeknownst to him, the authorities think he is more valuable continuing to serve as a railroad engineer. He is immediately branded as a coward by Annabelle and her family, and she tells him that she won’t see him again until he is wearing a military uniform. Thus Johnny’s big problem is disproving to the world that he is a coward. 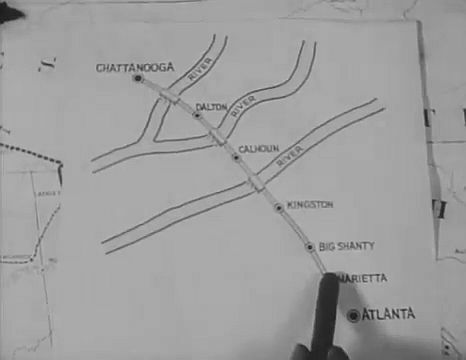 One year passes, and we see Johnny setting off northward from Marietta in his train. Annabelle, who is still not speaking to Johnny, is a passenger onboard on he way to visit her wounded father at the front. When the train stops for a dinner break at Big Shanty (Kennesaw), some disguised Union army saboteurs enter and steal the train while it is empty and head north. But Annabelle was looking around inside a baggage boxcar at the moment and becomes a prisoner of the train thieves. When Johnny looks up and sees his train heading off, he chases after it. The scene is set for the first of the famous chase sequences. To hinder their pursuers, the Union saboteurs cut telegraph lines and dislodge track rails. But Johnny furiously chases after them, first on foot, then in a handcar, and then in bicycle. When he gets to the town of Kingston, he finds a train full of Confederate soldiers to help out in the chase. But when he hurriedly takes off in the train, he doesn’t realize that the engine was decoupled from its cars, and he finds himself speeding down the tracks alone. Now we have two trains racing, one in pursuit of another. The pace of the film becomes absolutely frantic. There are a number of ingeniously filmed actions shown, as the saboteurs try to impede Johnny by decoupling one of The General’s boxcars so it will be left behind to slow up Johnny’s train and by dropping railroad ties on the tracks in hopes they will cause Johnny’s train to derail. Johnny manages to overcome these obstacles by performing amazingly dangerous and dexterous feats while perched on his pursuing train’s cowcatcher. 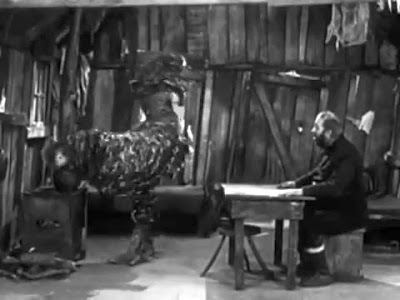 Keaton always worked without a stuntman, and anyone who watches this movie will wonder how they filmed it, when modern special-effects techniques were not yet available. Eventually, Johnny notices that he has crossed into enemy territory in Tennessee. 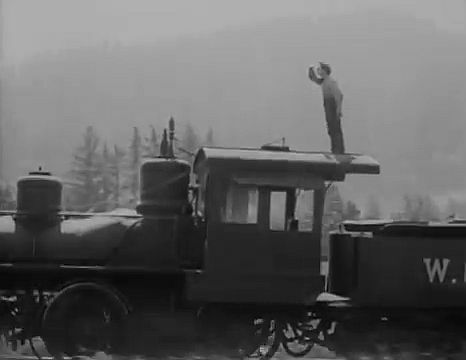 He abandons his train and escapes on foot into the forest. Johnny just happens to hide inside a house where Union army generals have come to meet in order to plan their next offensive. While hiding precariously under their meeting table, he overhears their plans to have their advancing army join up with a Union supply train at Rock River Bridge. He also is shocked to see that Annabelle is being held prisoner in the house. So then in a few slapstick action sequences, Johnny manages to knock out a Union guard, don his uniform, and then sneak Annabelle out of the house. They make their way to a train station where the stolen train, The General, just happens to be parked. There Johnny smuggles Annabelle onto the train, decouples the engine from most of its boxcars, and then steals the train. Johnny, back driving The General, is now heading south, and as Union soldiers pursue him in a separate train, the second chase begins. Again it’s a hectic sequence of back-and-forth manic maneuvers between the pursued and the pursuers, but this time the roles are reversed, and Johnny is the pursued. Once more we see frantically sabotaged telegraph lines, train track switches thrown off, and Johnny littering the track behind him with boxes from the car he is pulling. This time, though, Johnny is accompanied by the well-meaning but overly household-concerned Annabelle. At one memorable point the exasperated Johnny begins choking Annabelle out of frustration, but ends up kissing her instead. There are actually two Union trains rushing after Johnny in The General in this sequence. One has soldiers intent on capturing Johnny, and a following train has supplies intended for a meeting up with the Union army at the Rock River Bridge. Johnny arrives at the bridge first and manages to set a fire on the bridge and leave it burning there. Then he and Annabelle make it to a nearby town where a Confederate army camp is located and summon rebel soldiers to confront the Union army back at the bridge. Johnny wants to join these soldiers but is ignored, because he is not a member of the Confederate army. 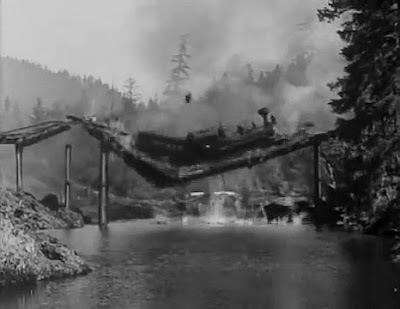 At the Rock River Bridge, the Union train attempts to cross over the burning bridge, but the bridge collapses, and the train falls to its destruction. 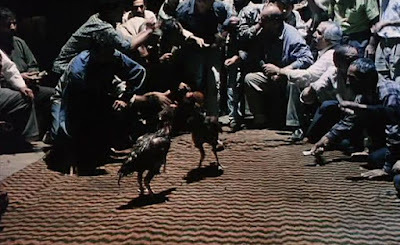 This bridge destruction was an incredibly expensive action for Keaton and co-director Clyde Bruckman to film, and they had only one camera take in which to record it . Note that Keaton was normally a painstaking perfectionist who often demanded many shooting retakes to get things just right – the shooting ratio for The General was greater than 30:1. So Keaton’s carefully planned craftsmanship and elaborate physical action sequences like this bridge collapse and train engine destruction were what caused the production expenses for this film to run way over budget. Then the assembled Confederate army soldiers ambush the Union army trying to ford the river, and the Union army is forced to beat a hasty retreat. With the battle won, the Confederate soldiers return triumphantly to the town. Johnny is still ignored by the celebrants, but when a Confederate general learns of Johnny’s capture of the commanding Union train saboteur, he hastily appoints Johnny to the position of army lieutenant. Johnny is recognized as a hero at last. The final scene shows Lieutenant Johnny awkwardly struggling to at the same time both kiss his now-forgiving Annabelle and also duplicate in acknowledgment the salutes of troops that pass by the embracing couple. Overall, Keaton’s The General manages to pack into a relatively complex plot structure an incredible mixture of slapstick comedy elements. Throughout the story, Keaton maintains his never-say-die enthusiasm and determination to get past a seemingly endless succession of insurmountable obstacles. What people undoubtedly remember most, though, are those two chase sequences, where the obstacle encounters appear at a dizzying rate. Unforgettable for me is the time when Johnny is sitting on his speeding train’s cowcatcher and has to remove railroad ties that can derail his train and which have been left on the tracks by those whom he is chasing. He somehow manages to hold a large, unwieldy tie in his arms and, with miraculously accuracy, heave it onto another tie lying ahead on the tracks, causing both ties to fall harmlessly away by the wayside. On another occasion, this time when he is being chased by a Union train, Johnny stops by a log fence to gather more wood fuel for his engine, and he hurriedly starts heaving big fence logs onto his train tender. After laboriously managing to get three logs onto his tender, the fourth log he heaves unluckily lands in such a way as to cause all of his previously loaded logs to bounce out of the tender and back onto the ground. And, of course, there is the famous artillery cannon sequence, when the fortuitous encounter of a curve in the railroad tracks saves Keaton from being blown away when the out-of-control cannon fires its load. Physical actions like these, which last only for a few seconds, must have taken extraordinary efforts to get right, and they successively appear to the viewer at a furious pace. Keaton often doesn’t fuel the viewer’s expectations of critical events like these much in advance. They just unexpectedly appear, one after another, and the ever-hopeful Keaton character has no time to reflect on or despair of what is swirling aground him. This is an aspect that distinguishes Keaton from Chaplin. Chaplin personalizes his encounters, making himself out to be the naughty underdog in a social world that is rigged against him. Keaton externalizes the perspective, thereby pitting an upright, innocent man struggling in a world, in which all of nature, itself, seems sometimes pitted against him. In that sense Keaton’s vision is often expressionistic, while Chaplin’s is not. So this relentless succession of acrobatic and perfectly executed circus acts is what makes Keaton’s The General a great film. Brilliant as The General is, though, I still think Seven Chances is Keaton’s finest film. But The General is excellent, nonetheless, and worth repeated viewings. Roger Ebert, “The General”, Great Movie, RogerEbert.com, (31 May 1997). 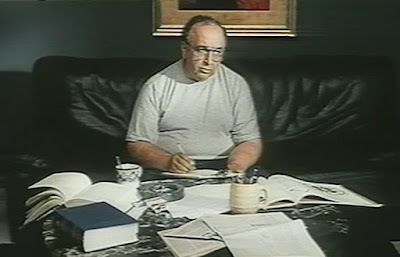 Roger Ebert, “The Films of Buster Keaton”, Great Movie, RogerEbert.com, (10 November 2002). Tim Dirks. 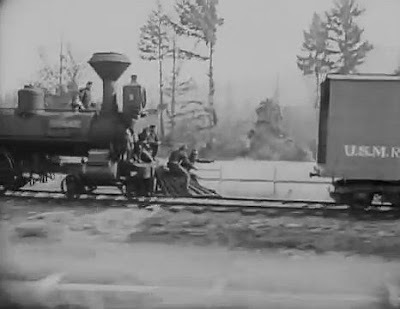 "The General (1927)", Filmsite, (retrieved 17 April 2018). Roger Ebert, "How the directors and critics voted / Roger Ebert / Top Ten", bfi.org.uk, The Internet Archive, (Archived from the original on May 17, 2012). “Great Locomotive Chase”, Wikipedia, (12 April 2018). In this sense it might be compared to Harold Lloyd’s Safety Last! (1923). the disastrous effects of drug addiction. Of his more recent (i.e. 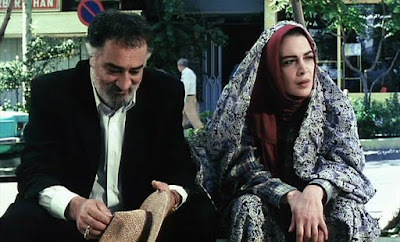 post-revolutionary) films, though, one of the more interesting has been Protest (Eteraz, 2000), because it presents a more subtle and ambiguous picture of the normally crowd-pleasing themes of revenge and honor. In fact the film presents the narratives of two men who go through an existential examination of just who they are and how they identify with and relate to the traditional socioculturally-defined themes of dignity and honor. The film starts by telling how Amir Farmanzad (played by Dariush Arjmand) vengefully murdered the unfaithful wife of his younger brother Reza (Mohammad Reza Forutan) in order to preserve his family’s dignity and self-respect. He willingly and pridefully confessed to the crime and was immediately sent to prison. When he learned that the woman he killed was pregnant with the unborn child of her paramour, Ahmed, Amir, rather than feeling any remorse, felt that his victim was even more guilty and more worthy of being murdered. In short, Amir is a quintessential example of a man for whom dignity and family honor are the highest values. He is willing to give up his own life in his efforts to maintain these tribal values. In fact Amir had sacrificed his own career opportunities in order to work and earn money that could support younger brother Reza’s education. But Reza’s college education evidently exposes him to higher, more humanistic, values than those of his brother. The scene shifts forward twelve years, when Amir is released from prison. Before he departs, his fellow prisoners, in particular a powerful gangster named Mohsen Darbandi (Mehdi Fat'hi), celebrate Amir for his heroic act of honor killing. 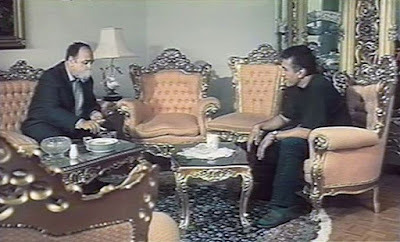 Just before his release, Mohsen gives Amir a valuable ring and urges him to look after his woman, Majdi (Bita Farahi). Reza: “I was talking about today’s sense of reason, a progressive society." 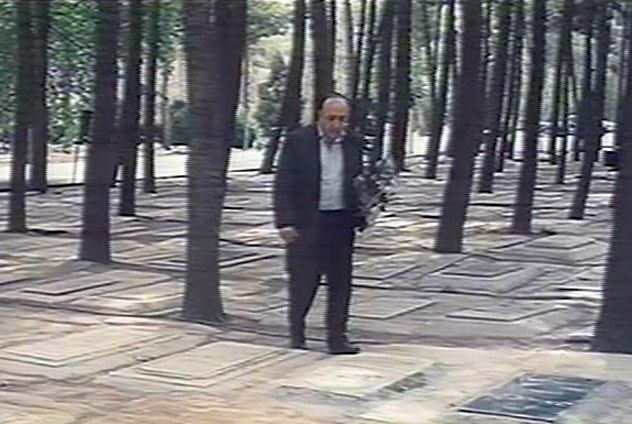 Although Reza humbly acknowledges the sacrifice that Amir made, he tells him that what he did was wrong and even led to the ruination of their own family. And even Ahmed, his dead wife’s lover, has lost his mind with grief. This focusses on dignity, honor, and loyalty. Resentment is harbored, and revenge is the primary operation of justice. Amir is associated with this view. This focuses on human reason, human rights, and universal values promoting the common good. Although Reza has been exposed to both moral regimes, he is now ready to embrace the one he has more recently learned – that of Rational Humanism. Note that I have on several occasions commented on how mistaken is the notion that dignity can have objective validity and on the even more absurd idea that dignity can be so objectively identified that it should be recognized as a universal human right (see, for example, my reviews of The Last Command (1928) and Bicycle Thieves (1948)). Dignity is a subjectively perceived posture, like pride, that is usually only internally assumed. In this connection I have cited two references that shed further light on this topic [1,2]. Thus the Tribal moral regime, at the root of which is an obsession for dignity, is a false perspective founded in resentment. Unfortunately, in the world today we are faced with a rising tide of what is referred to as “populism”, but which is really a return to tribalism under another name. There is little in the way of policy that connects the various political figures who are currently regarded as populists, such as Bernie Sanders, Norendra Modi, Recep Tayyip Erdogan, and Donald Trump. What these populist figures do have in common are calls for a restoration of lost dignity which has allegedly been damaged by shadowy elites. Their popularity is fuelled by the resentment invoked by their clarion calls for an authoritarian leader to suppress and punish these ill-defined elites who have attacked our dignity . Rule of Law. There needs to be a written set of laws that are made known to everyone and that can be changed by actions of the democratically-elected government. In the context of the film Protest under discussion here, we could say that these two social themes of Tribalism and Rational Humanism offer a conceptual background for our two protagonists, Amir and Reza, as they separately struggle to come to grips with who they are. The rest of the film now follows two parallel and largely separate narrative threads showing their contrasting worlds. 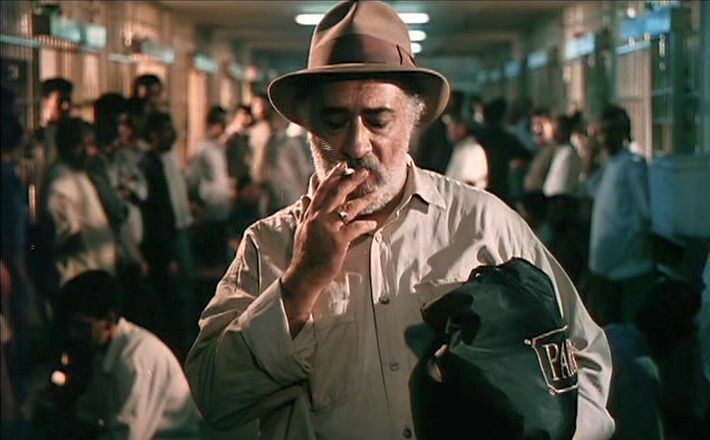 Amir’s world is the lower-class, crime-tinctured milieu of the urban jungle, which is a favourite setting for writer-director Kimiai. 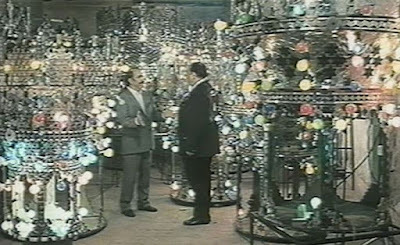 Amir goes to look for a job by visiting Mohsen’s agent, Fathollah, who operates a cockfighting pit for unsavoury gamblers. When Amir asks Fathollah for a job but only making “clean money”, Fathollah reminds him that no money is clean. Corruption is a part of everything. The dark world Amir inhabits is also hinted at by showing a shadowy figure who watches him ominously from the background during one of Fathollah’s cockfights. This turns out to be the embittered Ahmed, the lover of Reza’s murdered wife. Amir, himself, is shown to be tough, but he comes across as an essentially good-hearted and well-meaning person. The crime he committed was an act of self-sacrifice for his family’s honor and not one motivated by greed. 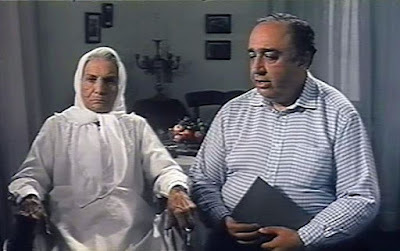 When he visits Ms. Majdi, who turns out to be gangster Mohsen’s sister, he sees that she is a hard-working seamstress and finds himself motivated to protect her when she is bothered by a street tough. 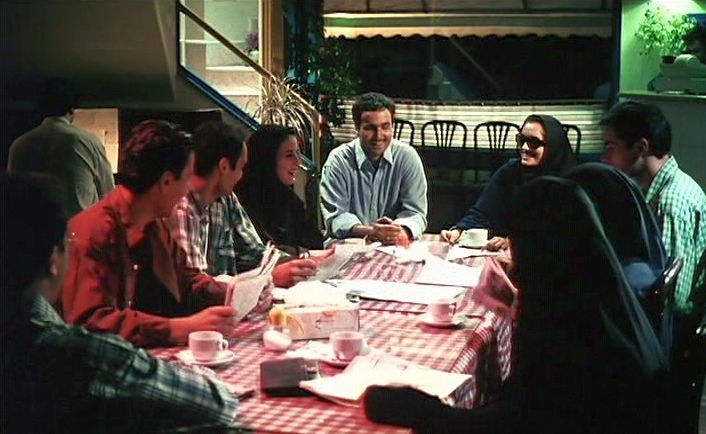 Meanwhile Reza is shown socializing at a restaurant with his former university classmates and discussing their favourite topic: Reformist Iranian politics. Even among Reformists, though, there are disagreements and lively discussions. They talk about the difficulties President Mohammad Khatami is having getting the Reformist agenda implemented, and a key issue discussed is whether the priority should be placed on opening up the economy or emphasizing freedom and human rights (i.e. whether RMDL dimension ‘R’ or ‘M’ should be prioritized). This policy divide existed even within a single Reformist party, which is here loosely referred to as the “Kargozaran party”. This was actually the Executive Construction Party, whose official news outlet was the Kargozaran newspaper. 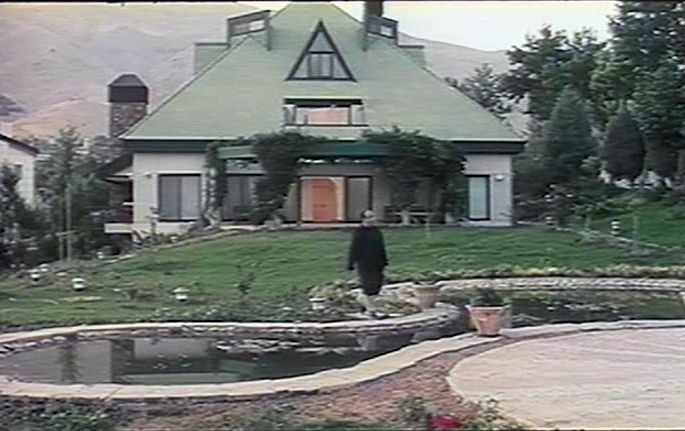 The party’s two leaders, Akbar Hashemi Rafsanjani and Gholamhossein Karbaschi, differingly championed the M and R issues, respectively. One of the friends at these discussions is Ladan, Reza’s new fiancé, who was recently attacked while peacefully distributing leaflets at a demonstration and now sports a black eye. Reza also has another close friend, Ghasem, who shares Reza’s lower-class status and who suffers from opium addiction. Ghasem warns Reza that Ladan’s educated, higher-class family background means that she is not a good marriage match for him. All of these discussions make Reza stressfully wonder who he is and where he is going in life. He has embraced new humanist values, but he feels himself unworthy of his brother Amir’s devoted (even though wrongful) sacrifice. The only job he has been able to find after all of Amir’s sacrifices to fund his education is the humiliatingly low position of a pizza delivery boy. Further self-doubts presumably affect both Reza and Amir when they visit their younger brother Yousef, who suffered a brain injury when he was beaten while participating in a peaceful demonstration at his university. Yousef is a sensitive and innocent young musician who harbors no resentment and now smiles at everything he sees. All of their separate encounters weigh on both Amir and Reza. Amir, who had dreamed of marrying the seamstress Majdi, finally decides that the murder he committed has permanently polluted him and has made him unworthy of her. He terminates his relationship with her and renounces further association with Mohsen’s gangster family. Similarly, Reza, feeling that he and Ladan belong to two different worlds, terminates his relationship with his fiance, too. The final fates of Amir and Reza offer a striking contrast. After watching another cockfight and seeing Ahmed there, Amir steps outside and fatalistically invites the murderously intentioned man to finish him off. The vengeful Ahmed goes ahead and fatally knifes Amir and then runs away in the night. Reza’s ending is different. At his work he is assigned to deliver a stack of pizzas to an upscale party and is shocked to discover when he gets there that the party is for Ladan’s wedding to a mutual friend of theirs. 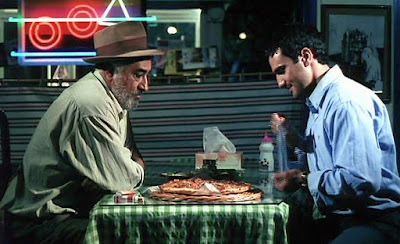 Ladan and Reza momentarily exchange painful eye contact before Reza returns to his pizza café. There he meets some of his old-college friends returning from Ladan’s party, who backhandedly console him by reminding him how filthy-rich Ladan’s family is and how she belongs to a different world from theirs. But then Ladan, still in her wedding dress, unexpectedly shows up at the café. She has apparently had a last-minute change of heart. She has renounced her Tribalistic arranged marriage and come to Reza to embrace the higher and universal feeling of boundless human love. Kimiai’s other films often deal with honor and revenge in ordinary Iranian society, but Protest offers a more subtle treatment of these themes. It gets the viewer inside the heads of its two main characters and presents these people grappling with changing social values. Admittedly, though, the film has some significant limitations. The storyline is fragmented, and the film consists mostly of conversations shown in relentless back-and-forth closeups, which is a difficult cinematic rhythm to employ at length. Another serious flaw is the treatment of the vengeful figure of Ahmed lurking in the shadows. This is not well identified and signalled visually, and it represents a botched narrative opportunity for Kimiai. Nevertheless, Protest probably deserves more appreciation than it has received. It offers a thoughtful picture of Iranian society in disruption and of people trying to come to terms with it. Steven Pinker, “The Stupidity of Dignity, Conservative Bioethics' Latest, Most Dangerous Ploy,” The New Republic, (28 May 2008). Samuel Moyn, “Dignity’s Due”, (2013), The Nation, (4 November 2013). George Weigel, “Democracy and Its Discontents”, National Affairs, number 35, (Spring 2018).